1. A button within the note that enables full-screen mode. This mode removes EVERYTHING except the words. Moving your mouse will make editing tools visible. 2. Full-Screen Mode also has margin and line-height functionality. Please Evernote! Please make this change to our desktop app! Doesn't typical Full-Screen mode work for you? On MAC, you can press Ctrl + Cmd + F to get into full-screen. While not everything is hidden, I think it's a pretty good start. Bear has the perfect "Distraction-Free Writing". Check out Bear's full-screen interface vs. Evernote's. This is something obvious. 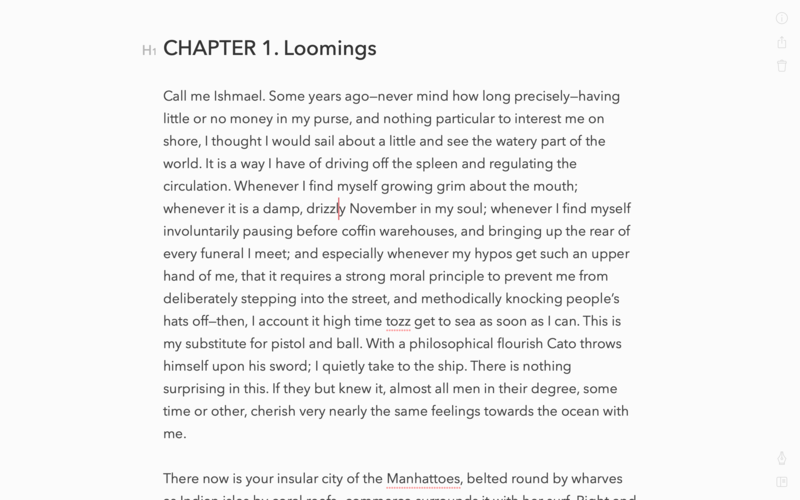 Almost anything made for writing or reading has margins and a clean interface. I feel like Evernote started years ago ahead of the curve. And now the interface seems like it's taking a backseat to innovation. Please Evernote team! I've been waiting for this easy change for years! I hate having to use two different apps for writing. I would love for Evernote to be my main writing center! It sure is a good start! But no, it's definitely not a perfect writing environment. I'm going to guess that you don't use Evernote primarily for writing long articles/books/etc? What other things like tasks and clippings do you use for Evernote? If you open the note you are working on, then open that note in a new window and switch that window to full screen, you get pretty close to what you're asking for. I use the Evernote editor for basic notes, but it certainly isn't my main writing tool. We (office) mostly use MS-Word/Apple-Pages, stored in Evernote as a note attachment. I would think serious writers use apps like Scrivner or Ulysses. I know. But it's still ugly enough to not be a distraction-free workspace. There are no margins on the document, and the writing tools don't disappear when typing. We (office) mostly use Word/Pages, stored in Evernote as a note attachment. I would think serious writers are using apps like Scrivner or Ulysses. I don't need those big apps to draft articles. 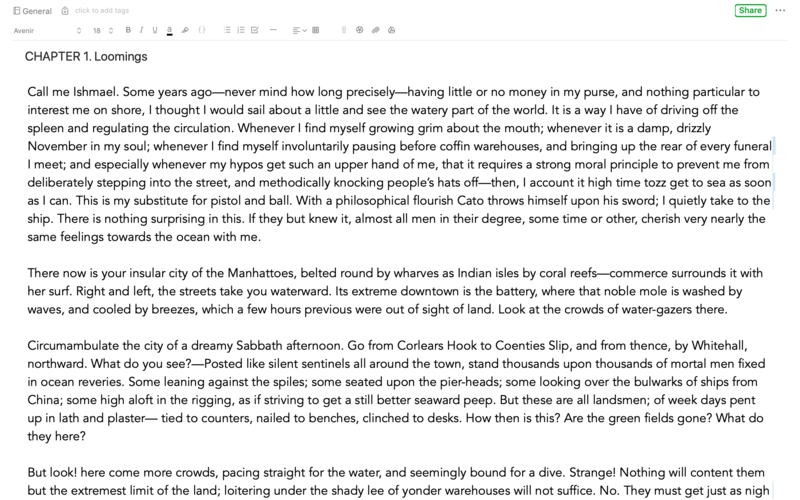 If I could just get the simple tools of margins and disappearing toolbar, then I'd be so happy. Evernote just isn't interested in jumping in that market because that's not where the money is. Money is in business features. I﻿﻿ do﻿n't need those big apps to draft art﻿icles﻿﻿. That's valid. I don't always use the heavyweight apps. There are many available editors; I use whatever gets the job done and meets my requirements. Hi anthonyr we are exploring reduced prominence of the entry points of lesser used features, some of which are currently in the note editor window. It may provide an experience closer to what you are looking for. Margins are not part of that exploration, but I have seen the ask elsewhere, so it will be considered in the future. I totally agree on this request. It's what keeps me from moving everything to Evernote right now. I'm currently using iA Writer and their fantastic Focus Mode and Night Mode. Can't beat it, but I wish it integrated with Evernote. So here's to distraction-free writing! ? People have been asking for this feature for more than 6 years now. Don't hold your breath. Instead, users can indicate their support for this request using the voting buttons in the top left corner of the discussion. Probably the best way is to use Evernote web version on evernote.com. Full screen is the best distraction free interface for evernote.